PLC based control system book which addresses discrete control systems using common control systems. 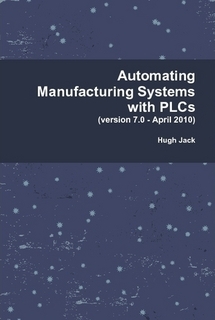 Focuses on the Allen Bradley family of controllers, thus allowing a deeper topic coverage than is normal in PLC books. Permission is granted to copy, distribute and/or modify this document under the terms of the GNU Free Documentation License, Version 1.2 or any later version published by the Free Software Foundation; with no Invariant Sections, no Front-Cover Texts, and no Back-Cover Texts. A copy of the license is included in the section entitled 'GNU Free Documentation License'. Control systems apply artificial means to change the behavior of a system. The type of control problem often determines the type of control system that can be used. Each controller will be designed to meet a specific objective. Many control technologies are available for control. Early control systems relied upon mechanisms and electronics to build controlled. Most modern controllers use a computer to achieve control. The most flexible of these controllers is the PLC (Programmable Logic Controller). Most education today focuses on continuous control systems. In practice, most contemporary control systems make use of computers and computer based control is inherently different than continuous systems. The purpose of this book is to address discrete control systems using common control systems. The objective is to prepare the reader to implement a control system from beginning to end, including planning and design of hardware and software. The intended reader should have a basic background in technology or engineering. A first course in electric circuits, including AC/DC circuits is useful for the reader, more advanced topics will be explained as necessary.